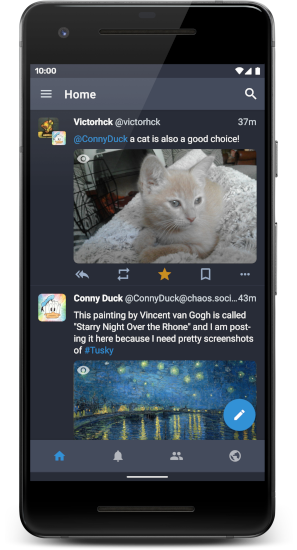 Tusky is a lightweight client for Mastodon, a free and open-source social network server. It supports all Mastodon features, like photos, videos, lists, custom emojis and is designed according to material guidelines. You can choose between a dark and a light theme in Tusky. It has notifications and a drafts feature. Tusky is free and open source software licensed under the GPL-3.0. If you have any questions, feature requests or you found a bug in Tusky feel free to open an issue on GitHub or send a message to @Tusky@mastodon.social.